In every new Formula One season, since its inception in the 1950s, there are changes aplenty. It’s an ever-evolving technological battlefield between teams as the FIA sets new regulations to shake up the sport and increase competition and fan interest. For 2019, there is a range of amendments to the technical regulations, both major and minor. 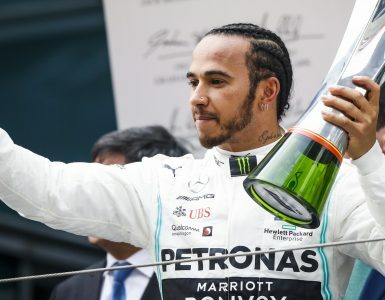 The last major rule changes occurred in 2017, effectively increasing the speed of the cars, the consensus being that the 2014 major rule changes had slowed the cars too much as a sporting spectacle. Often, minor changes to the rules can be to close off loopholes discovered the previous season or to correct long-standing oddities in the rule book. 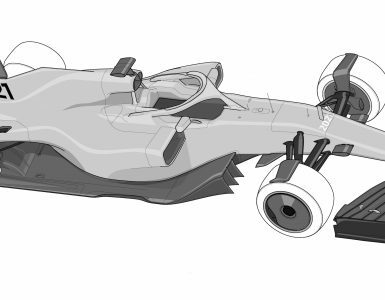 Interestingly, 2019 sits somewhere in between major and minor – there is a substantial change to the aero package, particularly around the front wing. But the other changes are all relatively minor, with some very good ideas making it into to the rule book. We can categorize the 2019 rule changes into convenient groups, the first being the major aero changes to improve overtaking, whilst there are also minor changes for fairness, safety, marketing, and some performance lead changes. The biggest change to the technical regulations surrounds aerodynamics and in particular the ability of one car to closely follow another car in front to aid overtaking. Steps to aid overtaking have long since been a factor in rules changes, although the 2017 aero rules made no concession to this factor when trying to make the cars 1.5-2s a lap faster. F1 cars are heavily aero dependent, decades of constraining aero performance through ever smaller wings has led to these aero surfaces being too heavily loaded and far too sensitive to the turbulence of a car ahead of them. Moreover, the teams have seeking to reduce lap times by improving the efficiency of the rear wing and diffuser, by trying to run them in cleaner air. Most of this turbulence comes from the wake of the car’s own front tyres, the unsteady airflow trailing behind the large spinning tyre naturally wants to be pulled into the ‘coke bottle’ area around the sidepods and over the rear wing and diffuser for efficiency in this area. Teams have hence made huge steps in the past ten years, or so, to tailor the aerodynamics of the front wing and bargeboards to push this tyre wake away from the rear of the car and direct it around the outside of the rear tyres, where it can do less damage. Known as ‘outwash’, this effect benefits the car, but also creates a larger turbulent wake for a following car to run into. When there was an absence of overtaking at the opening Grand Prix, there was often a kneejerk reaction by the rule makers to enforce immediate changes. Formula One Management (FOM) had established a technical working group, under Ross Brawn, to look at future regulations, with overtaking the key area of focus. As a result, several embryonic ideas resulting from their research were fast-tracked into the 2019 rule book, in order to push through changes before the 2021 season when the fully researched rules from Ross Brawn’s group will be introduced. 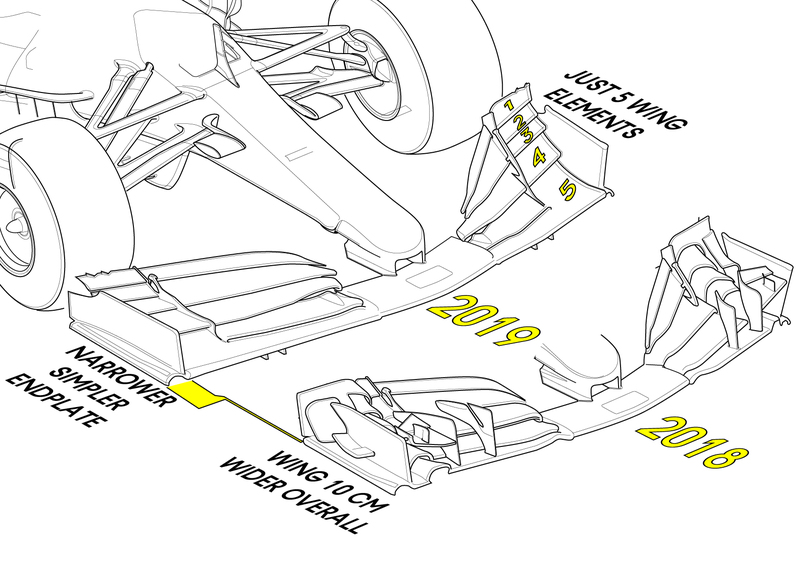 Thus, the main changes to the 2019 rules are focused around the front wing and brake ducts in order to reduce the outwash effect, being the most problematic for the following car. For the purposes of this article, we will simply take a high-level look at each rule change within their categories. 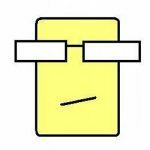 Subsequent articles will delve into greater depth at the individual rule changes. Before this, let’s confirm the things that aren’t changing! Firstly, the power units are largely unaffected. The formula will keep the 1.6l turbo engine with its double energy recovery systems. Additionally, no extra power will be available from fuel flow or energy recovery, no changes to the exhaust or engine note are implied in the new rules. Furthermore, the number of power unit components and penalties essentially remains the same. Also, necessary but unpopular is the HALO driver protection structure, this remains the same design, albeit with some detail changes to the bodywork around it. On the aero side, the complexity of the bargeboards and increasing complexity of the sidepod inlets remains unchallenged, while the nose tip regulation continues to allow the small thumb tip to extend from the nose, or a slimmer rounded nose as raced by Mercedes. 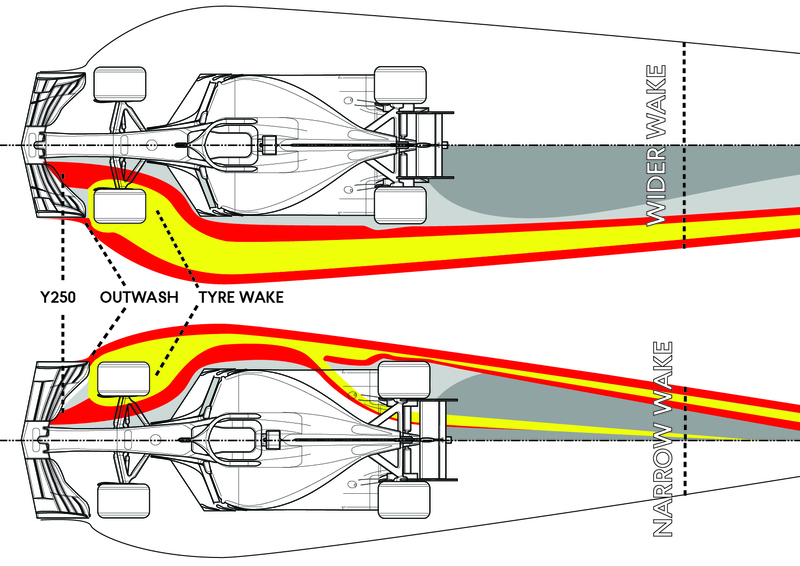 As outlined above, the key changes for this season are to improve overtaking by reducing the outwash effect of the front wing, and to increase the DRS effect of the rear wing. 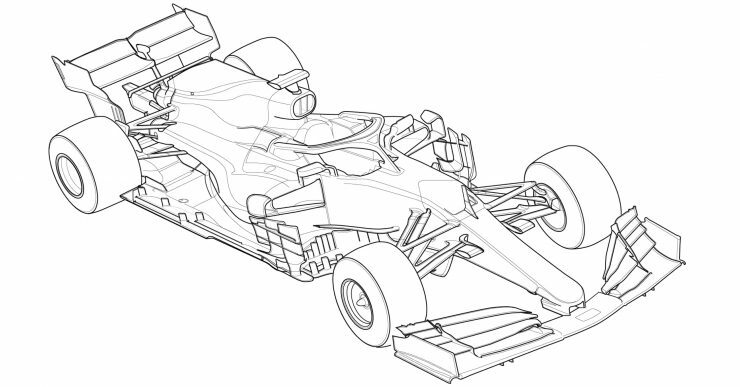 After a period of almost unlimited development, the current complexity of front wings will be cleaned up. The aim of the rules is to reduce the outwash effect of the wing. This has been corrected by ridding the wing of all its extraneous add-on winglets and bringing back the number of wing profiles to a more sensible count of five. Furthermore, the major culprit in creating this troublesome ‘outwash’ is due to the wing’s endplate. This has also been constrained, by making it simpler and narrower, as well as being pushed out in line with the front tyres. To do this, the rule makers have enforced a wider wing at a full two-meter width, along with an increase in length and depth to add lost downforce. 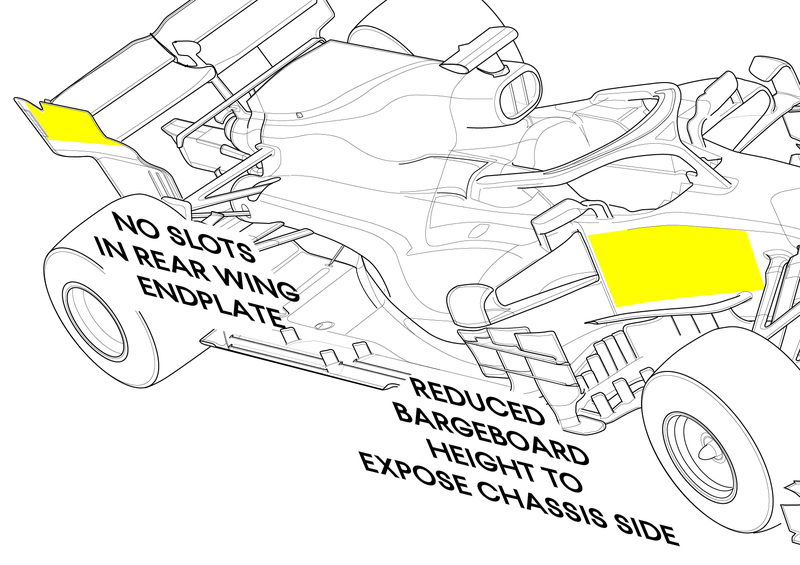 This brings F1’s wings back into a more realistic realm of design, which should aid the lesser-funded teams, as the simpler wings will be quicker and cheaper to produce. However, teams will want to recoup the lost outwash effect, so will endeavor to find other means with the allowable wing design. With this, the devil is in the details of the rules, as they say, and there remains a few potential loopholes that teams can employ in 2019. As the front wing leads onto the front brake ducts, the new rules also tightly limit the use of brake ducts for additional aero gain. Whilst there is yet to be a strict definition that they must only cool the brakes, they continue to be considered as ‘bodywork’ within the rule book. 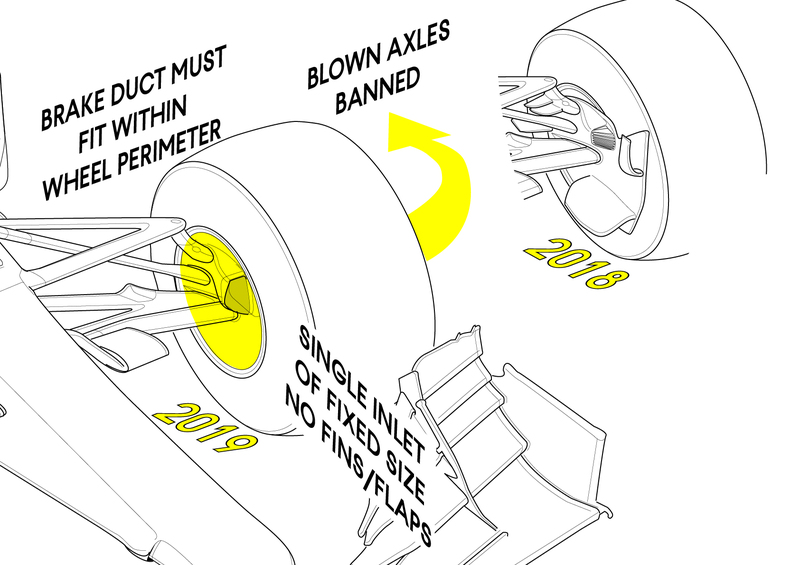 The key changes are that the blown axle designs (favored by many teams) are now banned, but other means of ducting air through the wheel for aero gain remains an option, plus the Mercedes wheel rim ‘holes’ tested late last year are not prohibited in the regulations, so are free to be used. More visibly, the inner face of the brake duct area must now fit within the wheel rim perimeter, no longer reaching forwards around the tyre sidewall. In addition, the visible surface of the duct is tightly controlled with a single inlet and geometrical restriction on the shape of the duct’s inlet scoop. This will rid the inner brake duct of all of its flicks and fins. Despite these limits on the front brake ducts, the rear brake continues largely unaffected by the new rules. 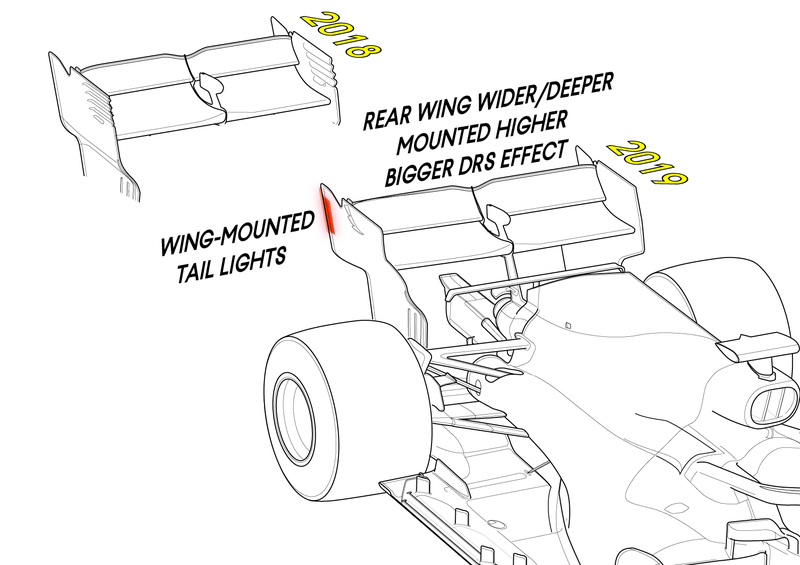 To afford a bigger DRS effect for overtaking, until the full overtaking enabling aero changes are brought in for 2021, the rear wing has been made larger. The larger wing creates more drag and the rules now allow for a larger opening to be created between the rear wing flap and main plane when DRS is engaged. This means that the loss in drag and boost in speed will be more marked than with the current wing. Thus, the wing is now wider and deeper but is also raised up higher. This vertical repositioning of the wing is not for aero reasons, but to allow the driver a better view behind through the repositioned rear-view mirrors. 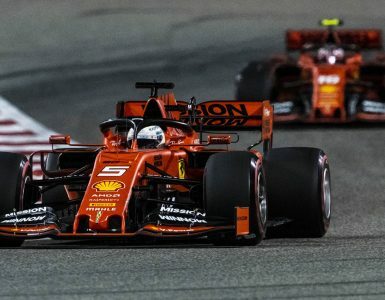 Pirelli had success in getting their tyres to cope with the higher cornering loads seen in 2018, especially at faster circuits with new track surfaces. They achieved this with tyres that had a thinner tread, to reduce heat build-up in the tyre. The anticipation of even faster cars in 2019 means that Pirelli will now run a similarly thinner tyre tread tyre design with all of its compounds at all tracks in 2019. To encourage teams and drivers to push harder through each stint, the total race fuel allowance has been increased by 5kg to a total of 110Kg. 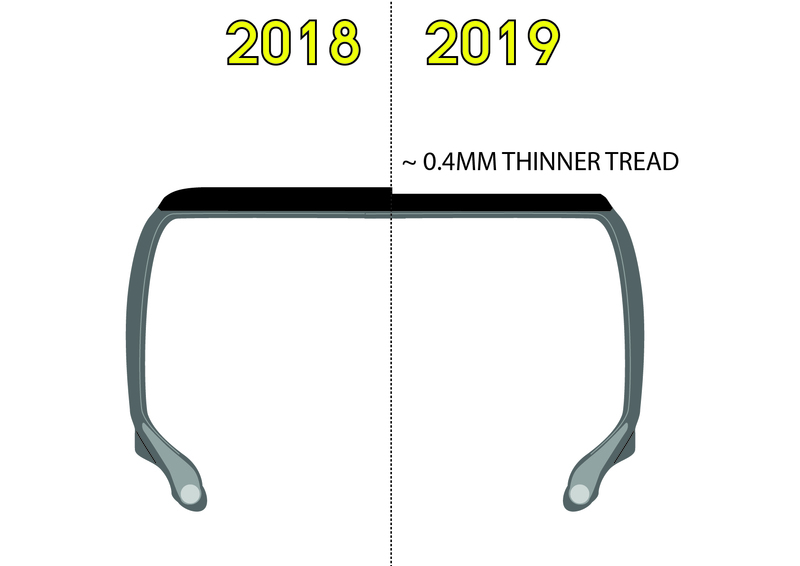 With several teams’ rear-view mirror designs being reviewed by the FIA in 2018, the new regulations have included some clarifications on what constitutes an acceptable mirror position and mounting. Along with the bodywork changes related to overtaking, some detail changes to the area between the sidepods and bargeboards have been applied to tidy the area up from the 2017 rules. The purposely burning oil for improved combustion, and therefore power, was largely restricted in 2018. The car’s auxiliary oil tank was missed from these rules. Now, the teams must run an empty auxiliary oil tank during qualifying, to ensure excessive amounts of oil are not burnt and cannot boost the car’s power output. 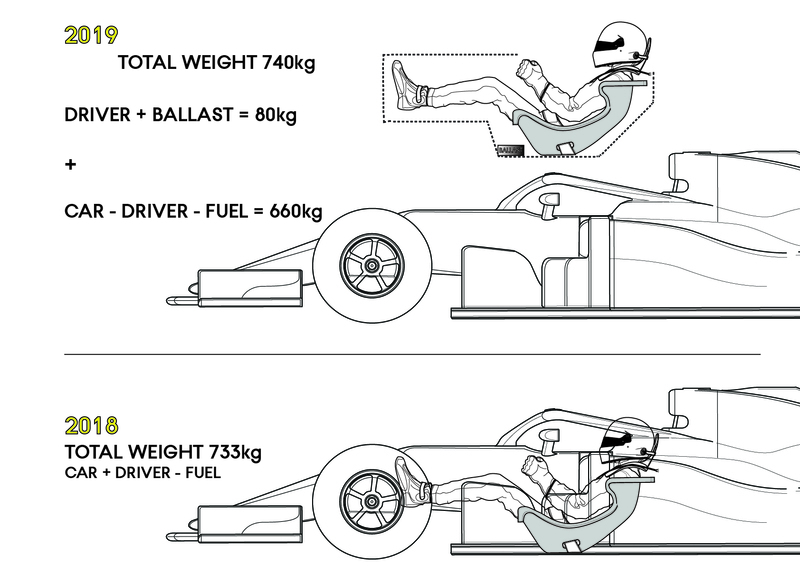 There is now a separate minimum weight for both the car and driver. This separation is more fair on taller or heavier drivers, so that they are not forced to lose excessive amounts of weight and that lighter drivers do not gain an advantage by lowering the car’s centre of gravity. Drivers will have to run cockpit ballast to meet the 80Kg minimum. World Endurance Championship-style lights must now be fitted behind the rear wing endplates. 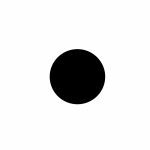 This should allow following drivers to get a clearer view of the car ahead in poor conditions. Drivers must wear a new specification helmet and a biometric glove. The helmet is safer in the event of a strike by debris to the forehead area and the glove transmits the driver’s vital signs to the on-track medical teams. The HALO continues to be allowed to wear aerodynamic bodywork around it, but this bodywork must now feature rounded peripheries to reduce sharp edges. To ensure the nose structure is kept on the car during a crash, it is subject to a more stringent crash test and must use four mountings. To afford sponsor stickers more space and better visibility along the side of the car, the bargeboards will be restricted in height. Also, to maintain better visibility for sponsors, the top surface of the rear wing endplate must be continuous, banning the drag-reducing louvers cut into this area. Tyres at each event will now only be marked as Soft, Medium and Hard. These tyre selections will be made from a range of five compounds. There can now be an onboard camera fitted to the HALO that looks back down on the driver. I really wished that they kept the regulations the same for 2019. Now the gap between the teams will only increase. When will they learn that stable regulations is the best solution for bringing the pack together. It’s also much better than introducing a budget cap in my opinion, because it’s very expensive for the smaller teams to keep building completely new cars… I’d love to hear your thoughts on this Craig! It’s a fair and correct point. This was all a knee-jerk from a dull opening GP. So, the rule changes were solely to introduce some overtaking improvements, from the Brawn development team, before 2021. Otherwise we’d have had the status quo for four years. “The anticipation of even faster cars in 2019”. Has not been suggested this year car will be slower cuz of the regulation change ? If unchanged, the cars naturally get quicker every year. Good summary Craig. The front wings were ridiculous and some changes were needed. I feel that Ross Brawn is superbly qualified and appropriately motivated to tweek the rules to add a bit of spice to car vs. car action. If anyone can, he can. Lesser teams should be allowed more testing and changes to allow them to catchup to the front leaders , as in motogp. Do you know if big-money teams have significantly better simulators than do the less-moneyed teams? If so, is there any consensus on how much this helps big-team drivers vs. small-team drivers? Considering everything, do you think the limits on driver-in-car testing helps or hurts the small teams? Turbulent wake is very much a meanlingless statement as it fails to properly describe the wake of the vehicle.